In a certain town, 5/7 of the men are married to 3/8 of the women. What fraction of the adult population is married? Assume monogamy. Last edited by ayw on April 13th, 2009, 7:34 am, edited 1 time in total. 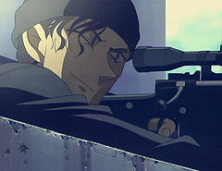 He's named Cool Kid and they named me the agent who feared them most...: Shuichi Akai ! @akai-kun, false but judging from your answer, you might be on the right track. It's slightly tricky, but elementary fractions. I thought I saw a reply by x64_02 that was correct.. where's it gone? Last edited by akai-kun on April 13th, 2009, 6:07 am, edited 1 time in total. I'm pretty sure you got it. Can you give me the exact fraction (in spoilers)? @akai-kun, Ah, then you were correct!Sorry about that. Well done!! @cancerkani, Thats right, although [spoiler]21+40=61 is not necessarily the population, but is indeed the smallest population satisfying the question, since you chose the smallest common multiple between 3 and 5. [/spoiler] Well done!! Last edited by ayw on April 13th, 2009, 7:10 am, edited 1 time in total. "The sum of two positive rational numbers is 15. For which two numbers the product of them is at the highest point? Does the result change when the numbers also could be negative? Explain your answer!" Last edited by akai-kun on April 13th, 2009, 7:28 am, edited 1 time in total. Good Idea! I'll change the name of the topic title accordingly. Last edited by ayw on April 13th, 2009, 7:35 am, edited 1 time in total. but it can be explained using approximation. John is celebrating his 36th birthday. One of the guests asks him how old his brother Joe is. John answers: I am now double as old, as Joe was, when I was as old, as Joe is now. Suppose we are given an ordinary chessboard (8x8) and 32 dominoes (2x1). Obviously, the dominoes can be arranged on the board to cover it completey. dominoes can be arranged on the reduced board to cover it exactly. Last edited by kat1214young on April 13th, 2009, 10:22 am, edited 1 time in total. ayw wrote: @akai-kun, Ah, then you were correct!Sorry about that. Well done! !